1 Put the chick peas into a food processor with the egg, garlic, curry powder and seasoning. Process to a rough paste, then tip in the beetroot salad. Pulse until the beets are finely chopped but still visible. Shape into 16 patties. 2 Heat the oil in a non-stick frying pan, then add the koftas (patties) in 2 batches and cook for 4-5 minutes over a medium-high heat until golden underneath. Turn carefully and repeat, until firm to the touch. 3 Warm the wraps according to pack instructions. 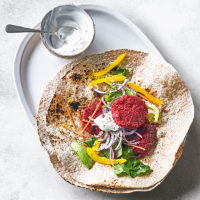 Spread some yoghurt over each wrap, top with the hot koftas, salad and onion, then roll up to eat. Serve with any remaining salad. To save time, use 2 x 190g packs of Waitrose Spinach Falafels or 2 x 192g packs Waitrose Sweet Potato Falafels. This recipe was first published in Thu Oct 05 09:34:00 BST 2017.